Update: Zorra and Lucky have been adopted! But don't fret; there are many more animals at the HSSAZ that would love a home. 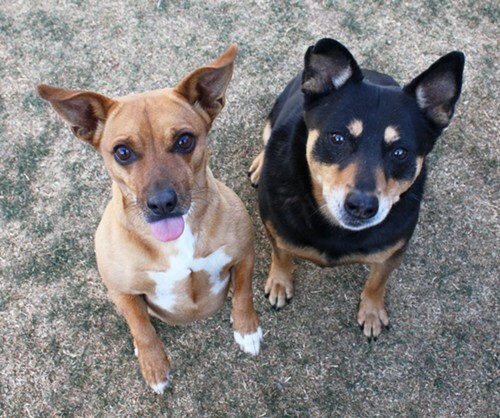 Get ready for double the cuteness with Zorra, a 12-year-old Queensland Heeler mix, and Lucky, a 6 year-old Dachshund mix. What’s better than giving a second chance to the world’s best dog? How about making two terrific dogs blissfully happy? Zorra and Lucky are some very sweet little old ladies looking to retire with dignity, love and each other. After spending the past five years together in a loving home, Zorra and Lucky were brought to the Humane Society when their family suffered financial setbacks. Now these wonderful ladies are looking to embrace a new beginning and hope that you find it in your heart to keep them together and in good spirits. Among their many interests, Zorra and Lucky enjoy car rides, neck scratches, and treats! The quickest way to their heart is through their stomach, so keep those Milk bones coming! If you could give these remarkably well-mannered and affectionate girls the happy ending they deserve, please visit them soon at the HSSA. And with a 2-for-1 adoption fee, it’s easy to get twice the love! And can you resist the video of these two cuties? Come meet Zorra and Lucky! They're currently living at the Humane Society of Southern AZ, 3450 N. Kelvin Blvd. The Humane Society is open Monday through Saturday from 11 a.m. to 6 p.m., and on Sunday from noon to 5 p.m. Their phone number is 327-6088. And don't forget about Stoney the cat. She's still looking for a home, too.